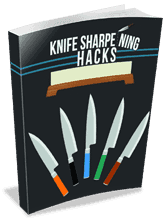 I’ve written some columns showing Japanese recipes, basically things to do with your fancy Japanese knives, and I’d like to continue that. We’re going to make Nankin-fukume-ni なんきん含め煮, pumpkin nimono. The pumpkin nimono I will cook in this article. Given the way these dishes are cooked, it’s no more difficult to make a large quantity than a small one—in fact, a very small nimono burns easily—so you just scale the pot size to the number of people and you’re good to go. In addition, nimono works best when there are lots and lots of vegetables involved; as with this pumpkin dish here, it is often entirely vegetables. What’s more, there’s essentially no fat. Put those factors together—easy to do in large scale, incredibly cheap, healthy—and you can see why nimono is also a staple of kyushoku, or school lunch. Kyushoku isn’t like what I remember of school lunch as a kid. Every day, a certain number of kids from each class or grade are designated to be food-helpers. Down in the big school kitchen, the cooks make up a selection of dishes: a nimono, rice, soup and pickles, whatever. When they do things like fried chicken (kara-age), each kid gets only one piece, because it’s not good for them. The daily helpers collect the food on a cart, assisted by a grownup if this is elementary school, and they bring it to the schoolroom. Wearing aprons, hair coverings, and face masks, the helpers serve out a portion of everything to each kid. Everybody gets some of everything; “I don’t like that” isn’t allowed. Everybody finishes what they’re served. If you wish, you may have seconds of anything after you’ve eaten firsts, and then you don’t have to have the whole set, but you do have to finish it. Everybody gets a little carton of milk, and everybody has to finish it. In the younger grades, nobody goes to recess until everyone finishes their whole lunch. You might wonder, “what about allergies?” Well, unless they’re well documented by a physician, allergies aren’t allowed. (!) And kids who do have serious allergies have to bring their own lunch, because the school doesn’t have resources to deal with that. Fortunately, serious food allergies aren’t all that common in Japan. In fact, nimono is such standard kid-friendly fare that it’s served to little kids in daycare! When my daughter was 13 months old, she started daycare in Kyoto, and they served nimono—cooked very, very thoroughly until pasty soft—almost every lunch. To this day the smell of the stuff makes her mouth water and her eyes go all misty. This is the flavor of childhood and home—the ultimate Japanese comfort food. Okay, now my mouth is watering. Let’s get started! If possible, use kabocha, a tough green-skinned pumpkin with bright orange flesh. You can use regular orange pumpkin, acorn squash, anything like that. Avoid soft or fibrous flesh: no spaghetti squash. 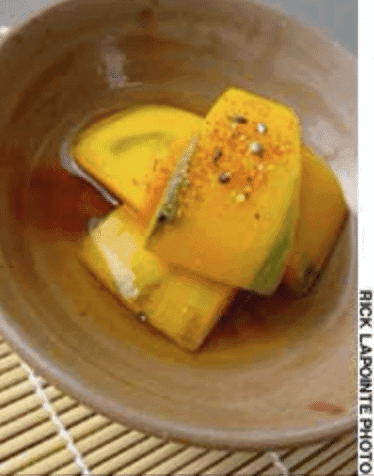 Most squash is watery, so you must adjust for that by using less dashi; kabocha is dry. First, cut straight down to one side of the stem, bracing the tip of the knife with your left hand. If it won’t extend the whole way, cut down on one side, turn the pumpkin around and cut again to split in half. Clean with a spoon. Lay the halves cut-side down and cut wedges, usually sixths or eighths; you want wedges with the fattest part about 2-3” across. Put away the brutality knife and get out the usuba. Now be careful: it’s a tough vegetable, and you’ve got to be mindful so you don’t chip the edge. Lay the wedges on a cut side and cut crosswise in half. Pick up a chunk and hold it in your left hand, pointy part to the right. Now do the basic peeling technique, starting just under the point of skin on the right. Your left thumb guides the squash into the knife, the right thumb controls thickness, and the right hand moves the blade away from you to cut, then back to return; the downstroke doesn’t cut. Don’t be forceful or twist the usuba. The skin is much tougher than the flesh, so the knife will want to cut flesh and remove skin: let it work. Repeat for every wedge. Depending on the type and ripeness of the squash, the peeled face may be greenish. Put the wedges down and cut in half sideways, trying to make equal-weight chunks; if the squash is small (e.g., acorn squash), this isn’t necessary. You want big chunks, a little too big to be a proper mouthful—and don’t be dainty. Now if you take these pieces and simmer them, they’ll turn into mush. So hold a piece in your left hand and do the same peeling technique, but this time only taking maybe 1/8-1/4” off each sharp edge, making a beautiful 45-degree bevel on all sides, all the way around. This takes time, but once you’ve finished one pumpkin, you’ll be going much faster and more evenly. Remember: left thumb controls the movement of the cut, right thumb controls the thickness. Try to cut only on the upstroke. Now that all the pieces are beveled, they won’t turn into mush. Why? Because the mush thing starts at the thinnest point and spreads from there. Since all the thin points are now blunt, it takes quite a while for the flesh to break down. Make dashi: Brush the kombu with dry paper towel to remove dust; anything that doesn’t come off with light brushing should be left on. Put it in a pot, breaking it in a couple of pieces if necessary, and add the water. Bring to 140-150F and hold there for as long as possible, up to 1 hour. Remove the kombu and reserve the big pieces (discard teeny scraps), bring to a strong simmer, and add all the katsuo-bushi. Shut off the heat, wait 2-3 minutes, then strain very fine through cheesecloth or strong paper towel. Save the strained katsuo-bushi in the cloth or towel. Select a saucier or saucepan in which the kabocha will fit in one layer. Put the reserved kombu in the bottom of the pot, and lay the kabocha on top, skin-side up. Add the dashi—it should come about 2/3 up the sides, but use less with more watery squash. Bring to a gentle boil and add the sugar, mirin, and soy. Shake gently until the sugar dissolves. Spread out the cloth or towel with the reserved katsuo-bushi until it’s the size of the pot. Lay it on top of the kabocha in the pot. Cut a parchment paper circle the same size: fold a square of parchment into a triangle and keep folding until it’s a narrow point, cut to the radius of the pot, and then cut the last half-inch off the point; unfold to have a circle with a hole in it. Place this on top of the katsuo-bushi mass and reduce the heat to a gentle simmer. Cook for a long time, probably 30 minutes or more, until the liquid is almost entirely reduced. It should not sizzle in the pot, but the liquid should be a minimal, slightly thick sauce. Remove the paper and katsuo-bushi. Arrange the kabocha pieces in a pretty dish and pour some liquid on top. Serve warm. This image is from The Japan Times, because my pretty dishes were packed in moving boxes when I made this. Welcome to Japan’s true home taste.